Tying Note: Tie the Booby in a variety of colors. 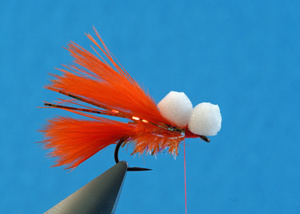 Over 30 years ago, Englishman Gordon Fraser created a unique, non-traditional fly he christened the Booby. Once seen it is easy to figure out how the fly’s name came to be. 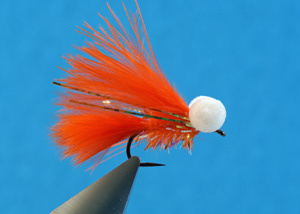 The Booby is a simple pattern utilizing mobile marabou and a distinct pair of buoyant foam eyes. The action these two materials create is deadly and Boobies have proven themselves worldwide. More attractor than imitator the Booby wobbles and swaggers during the retrieve aggravating and angering trout into striking. Since its initial conception the Booby has evolved into a variety of styles and practically any pattern can be 'Boobied' by the simple addition of foam eyes. Upon discovering this pattern over 10 years ago, it has been a constant fly box staple. Tethered to a short 3-4 foot leader on a sinking line Boobies allow fly fishers to probe weedy debris choked regions with confidence. The sinking line follows the bottom contour as the Booby bobs and skitters above the weed tops in tantalizing fashion. A Booby makes an excellent choice on clear lakes when trout are patrolling marl flats. Using a fast sinking line cast the fly into the trout’s general vicinity taking care not to spook them. Allow the line to wallow into the marl. As a trout cruises into view begin either a steady handtwist or 10-12 inch strip pause retrieve and let the Booby work is magic. If more than one trout latches onto the fly be prepared for a solid grab as they compete for the prize. The buoyant philosophy of the Booby also adapts to imitative dragon and damselfly nymph patterns. Surface swirling trout are ideal candidates as the Booby makes an excellent disturbance pattern. The waddling wake of a Booby draws curious and aggressive fish from a distance. An all white Booby works wonders on fry feeding fish. 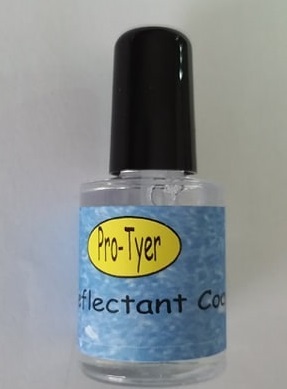 Adding adhesive eyes to the ends of the rounded foam adds an added touch of realism and inspires angler confidence. Original Boobies consisted of a long marabou tail, dubbed or chenille bodies and large round Polystyrene foam balls sheathed in stocking mesh. Despite the protective stocking mesh, the original eye materials did not survive repeated trout mauling and has been replaced with durable closed cell foam bars. Some suppliers now offer pre made foam dumbbells. 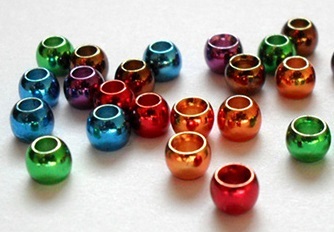 When it comes to Booby bodies, fly tyers have a host of body materials to choose from. Personal favourites include dubbing, peacock herl, CDC, Crystal Chenille and Tri-Lobal Hackle. Boobies can be tied both with and without wings at the tier’s discretion. Creating foam dumbbells is simple. Trim a shank length piece of Booby Body Foam. Using curved scissors round the ends of the foam bar. Rounding the eyes stops the finished Booby from spinning during the retrieve. Place a pin or sewing needle horizontally into the jaws of the vise. Spear the prepared foam bar lengthwise onto the pin or needle. Attach the tying thread at the mid point. 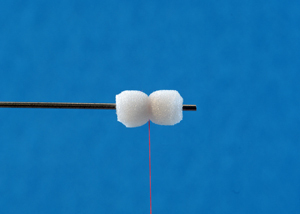 6/0 tying thread works best as finer 8/0 thread can break under pressure and potentially slice through the foam. 3-5 tight thread wraps collapses the foam bars mid section creating a dumbbell. Whip finish and slide the completed dumbbell from the pin. During a single sitting, manufacture multiple foam dumbbells for future Booby tying sessions. An alternate method involves stabbing the mid section of the rounded foam section onto the hook in a perpendicular fashion. Slide the foam bar forward to the hook eye. Attach the tying thread behind the foam bar. Figure eight wrap the eyes in place and complete the remainder of the fly. Experiment with both methods, both approaches work fine. For those prefer to have their eyes in place for proportional purposes stabbing the dumbbell eyes on the hook is best. I prefer creating my own foam dumbbells and tying them in place once the balance of the Booby is complete. 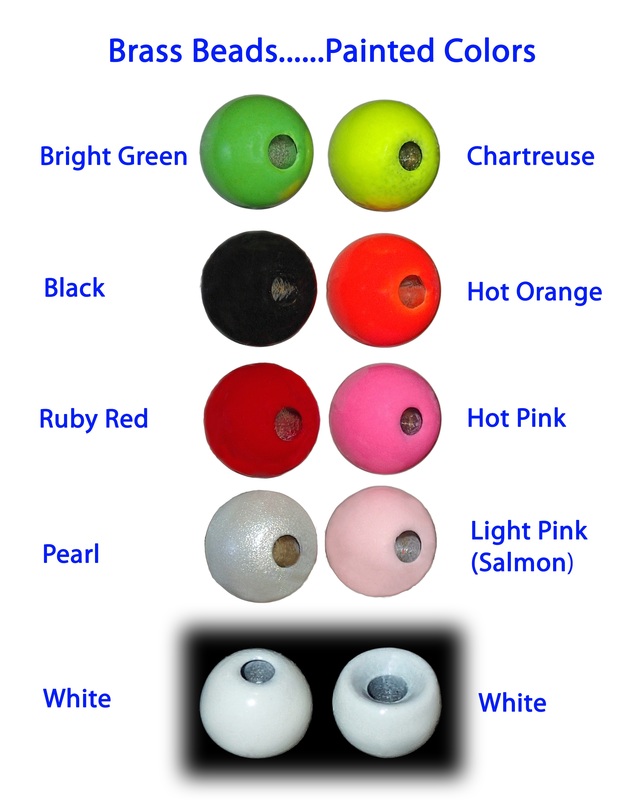 Booby eye placement is standard for most eyed patterns, approximately two hook eye widths back from the hook eye. The foam dumbbells must have a smooth even thread base to mount on. Steep drops or cliffs formed from tying off body or wing materials causes the eyes to slide forward and becomes frustrating. To tie the eyes in place lay the foam dumbbell on top of the hook with the waist of the dumbbell in front of the body and wing, parallel to the shank. Bind the foam in place using 3-5 firm wraps of tying thread. Rotate the eyes 90 degrees, perpendicular to the hook shank. Place additional securing figure 8 wraps of thread locking the eyes in place. Build a neat head directly in front of the eyes and whip finish. Pull the completed eyes down spreading them apart and exposing the thread wraps. Add a dab of Super Glue for added security. Place an additional drop of Super Glue on the underside thread wraps as well. Hook shank length is a critical consideration for any Booby. Standard shank hooks should be used as long shank Boobies often result in deep hooked fish. There is something about foam patterns, as trout consume them with confidence. Never fish a static Booby. A moderate paced handtwist or strip pause retrieve in conjunction with a standard or short shank hook reduces the danger. Some secure the eyes under the hook shank so the Booby rides point up resulting in more lip and roof of the mouth hook-ups. The drawback with this method is the eye placement affects the hooking ability of the fly. Experiment with the Booby. 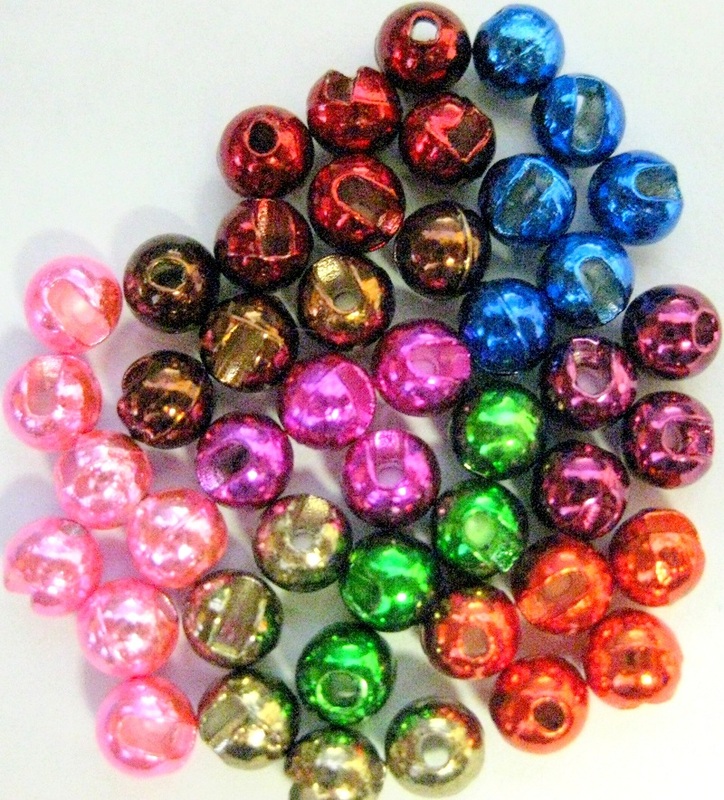 Tie them in loud obnoxious colors along with traditional muted tones. Personal favourites include black, black and chartreuse, chartreuse and hot orange. Garish Boobies often awaken sullen trout. In the event of daphnia, feeders try a Booby that matches the color of the zooplankton. An approach can turn a day of fruitless casting into one of a few fish or more. 1) Trim a hook shank length section of Booby Body Foam. 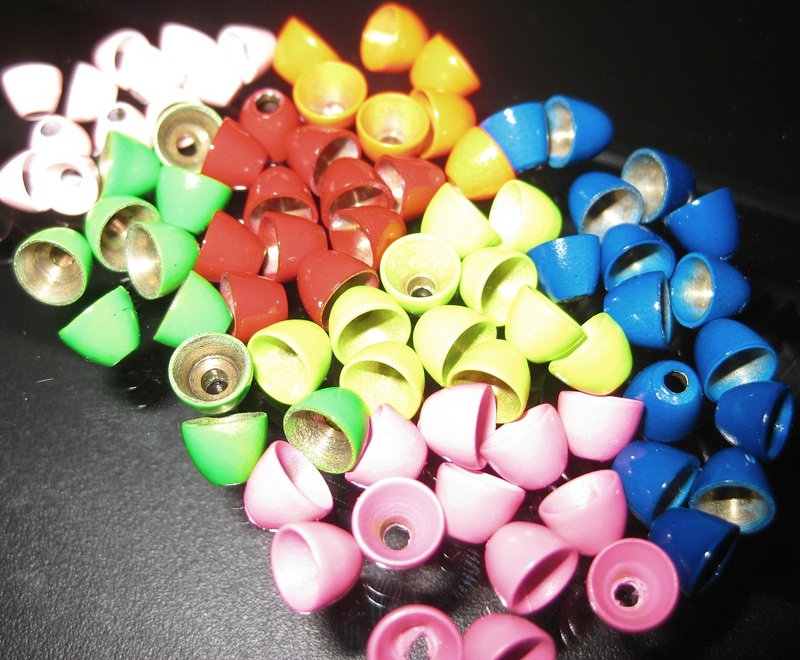 Round each end using a curved pair of scissors. 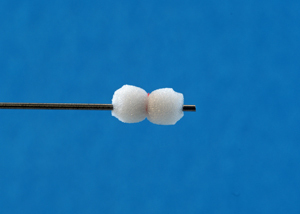 Stab the prepared Booby Body Foam lengthwise onto a jaw mounted pin, needle or in this example a tube fly mandrel. Attach the tying thread to the mid section of the foam bar. 2) Make 3-5 tight wraps of thread compressing the foam bar creating a foam dumbbell. Whip finish and trim the tying thread. Use this process to create multiple foam dumbbells for future Booby patterns. 3) Place a standard wet fly hook into the jaws of the vise. Cover the shank with tying thread. Strip a section of marabou from a marabou plume. Tie in the marabou just behind the hook eye back to the bend of the hook ensuring a firm tie in and a smooth body foundation. The finished tail should be shank length. 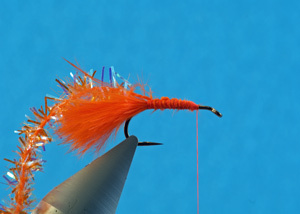 Avoid tearing the marabou to length, a measured tail ensures maximum marabou movement. Strip the end of a length of Crystal Chenille to expose the core. Tie the Crystal Chenille in by the core at the base of the tail. Advance the tying thread so it hangs 2 eye widths back from the hook eye. 4) Strip a second clump of marabou from a marabou plume of equal volume to the tail. 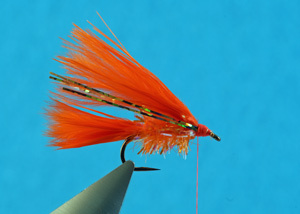 Tie in the marabou clump directly in front of the body forming a wing. Make sure the tips of the marabou wing are even with the end of the tail. Tie in 2 stands of SuperFlash or Flashabou along each side of the wing. Build up a smooth even thread base for the foam dumbbell eyes. 5) Hold the foam dumbbell on top of the hook shank so its narrow waist is just in front of the wing. Using 3-5 wraps bind the foam dumbbell eye in.